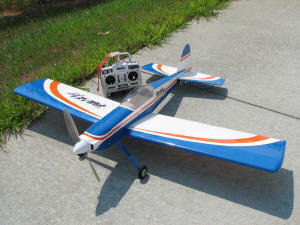 I first saw the E-flite Mini Pulse XT is an article in Back Yard Flyer. As with most E-flite models, the Mini Pulse XT is very attractive both in shape and in finish. The review writer heaped praise upon the model because of the excellent construction and the ease of preparation for flying. Being in the market for a small, inexpensive, aerobatic electric airplane, I decided on the spot that I had to get one. A trip to King RC, in King, North Carolina (about 20 miles south of Mt. Airy) got me my Mini Pulse XT. I bought the basic version without the motor or electronics, for $100+ tax. It ended up being a mistake, because after just a few flights, the E-flite Park 400 outrunner motor burnt out (the one I had used in the e-Spirit for a couple years). I ended up spending about $70 (including shipping) for a new E-flite 450 motor, which is the one that comes with the $210 version of the Mini Pulse XT. So, basically, I would have only paid $40 more to also get four sub-micro servos and a spare brushless ESC. Oh well, live and don't learn, as Calvin would say to Hobbes. I had opened the box while in the hobby shop, so I knew by the time I got it home that the quality was everything promised. Unlike what I had read in reviews of so many other ARF models, The Mini Pulse XT was solidly glued together and there was not a wrinkle anywhere in the film covering. Everything fit perfectly. The only flaw was a small crack in the front of the canopy, but again, I had seen that in the hobby shop. Within about 2 hours the Mini Pulse XT was ready for its first flight. The YouTube video captures the event. Because the grass at the park was too long to allow a takeoff from the ground (it only had the E-flite Park 400 motor at the time, rather than the recommended 450), I hand launched it. There was plenty of power even with the 2-cell, 1500 mAh LiPo battery. After a few flights, the Park 400 motor crapped out. Since by then I knew what a great flyer the Mini Pulse XT was, I went ahead and made an investment for an E-flite 450 outrunner motor, and purchased two 3-cell, 2100 mAh Lithium Polymer batteries for it. With the new setup, the Mini Pulse XT would climb straight up on a full charge. It is no exaggeration to claim that even with a flight full of aerobatics (not a lot of extended vertical stuff), I consistently got 20-minute flights. It was amazing. The handling during takeoff and landing was the best I've ever experienced for a tail dragger. As with many of my airplanes, I ended up selling it. My poor eyesight made me leery about doing a lot of the aerobatics and taking such a small model far away (it would really move out at full throttle). A young man purchased it from me at a swap meet in Winston-Salem, and contacted me recently to say that with a few mishaps, he actually taught himself to fly. 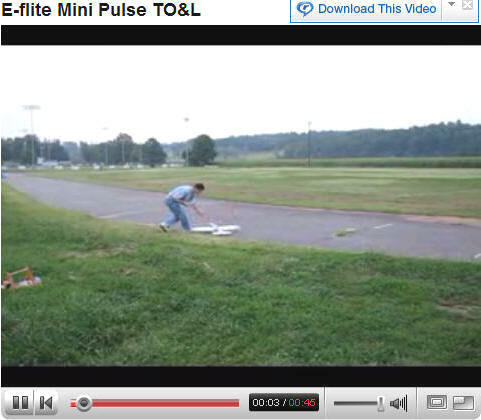 I'm not surprised, because the E-flite Mini Pulse XT is an excellent airplane, and the guy seemed pretty sharp. I don't imagine myself as being as confident when I was his age... maybe it's all the video games and simulators that kids grow up with nowadays.